Finally, Lifetime has released a full trailer for the upcoming TV movie “Aaliyah: The Princess of R&B.” The film has already been mired in controversy as the singer’s family has come out against it (saying that they were not consulted at all about the project) and its first leading lady, Disney pop starlet Zendaya, dropped out for unconfirmed reasons. So with this first real glimpse into the project, was all of the drama worth it? In the trailer, we see Aaliyah’s portrayer, Alexandra Shipp, rocking Timbalands, baggy pants, and a loose-fitting jean jacket. She is doing her best impression of Aaliyah’s infamous dance moves, though taking in the rest of the shots, it seems like the film is much more focused on her personal life. Like VH1’s CrazySexyCool: The TLC Story, the goal seems to be to shine a light on what transpired behind the scenes. Does it all come off a tad soap opera-ish? Yes. And in light of the family’s disapproval, should we believe anything that we see on-screen? No. But, the costuming seems spot on, Shipp manages to at least be reminiscent of Aaliyah, and the content is bound to be entertaining with what is already known about the singer’s life. You’ll also see actress and singer/songwriter Alexandra Shipp shortly in other high-profile projects such as “Drumline 2: A New Beat” and Universal Pictures’ “Straight Outta Compton.” The film also stars Rachael Crawford and Sterling Jarvis as Aaliyah’s parents, Diane and Mike Haughton; A.J. 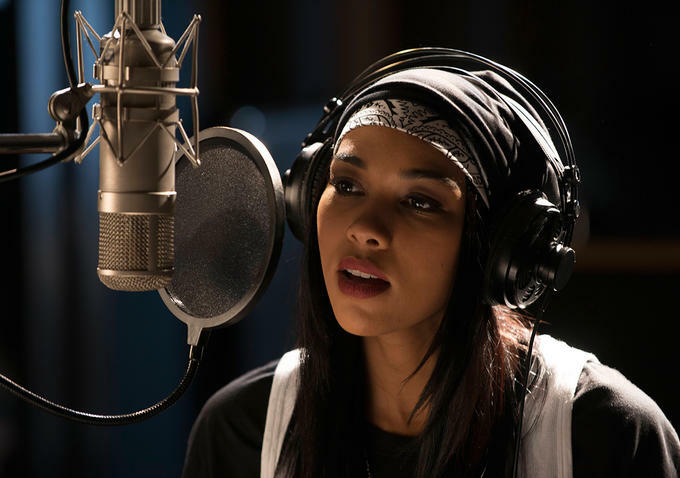 Saudin as Aaliyah’s brother Rashad Haughton; Lyriq Bent as her uncle and music manager Barry Hankerson; Anthony Grant as Damon Dash; Izaak Smith as Timbaland; Elise Neal as Gladys Knight; and Chattrisse Dolabaille as Missy Elliot. Catch the premiere Saturday November 15th on Lifetime. Is this project worth a watch? Tell us your thoughts in the comments section below! June 2, 2015 What Happened to Reality TV?